When Molly and Peter Hughes first moved to Lancaster County, they never expected to stay longer than five years or so. But as they found out, this area grows on you—and this agricultural heart of the state has been the perfect place to grow their successful agricultural consulting business, Red Barn Consulting. Molly Hughes graduated from the University of Idaho with a master’s degree in civil engineering, and Peter Hughes received his degree from Washington State University in natural resources science and in biology. In 2001, not long after they married, the company Peter Hughes was working for filed for bankruptcy, so he and a coworker, wanting to continue to work in the natural resources field and work with the farming community, decided to start Red Barn Consulting. The business grew slowly but steadily. In 2008, though, Hughes said that the business reached a major turning point when she and her husband found that they had a different vision for their business than their partner did, and so they bought him out. Although Hughes did not have a background in agriculture, her husband did, having grown up working on his cousin’s dry-land wheat farm in Washington state. “We have always believed that farmers are the first environmentalists since they work hard to protect the soil and water resources and are stewards of their own land,” she said. Red Barn was designed to assist the agricultural community through the permit process, which can be extensive. 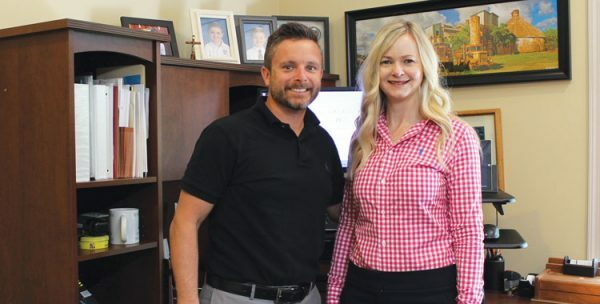 Hughes said that because she and her husband have opposite strengths when it comes to what’s needed to make the business successful, it has made for a good working relationship. Although they both wear many different hats on any given day, Hughes’s favorite part of the job is coming up with solutions to design challenges. “I very much have an engineering personality, though, so my least favorite part of my job is communicating with outside agencies,” she said. Providing consulting and engineering services focused solely on agricultural needs is unusual and in demand, and Red Barn Consulting has been fortunate to be able to work on projects in many different geographical locations. It’s important to the Hugheses that they provide their clients with the absolute best value possible because often, the projects they work on with their clients may be the biggest business decisions those clients have had to make so far. The success of Red Barn Consulting is due mostly to satisfied clients recommending their work to others. The Hugheses are big believers in volunteerism, and in particular right now, they prioritize volunteering with organizations and activities that have a direct impact on their two young sons. “We constantly talk about how the boys will only be this age once, and it is a priority to be involved in their daily lives,” Molly Hughes said. She also said that she feels moved to support people who are struggling and strives to instill those values in her sons also. As Red Barn Consulting continues to grow as well, both Molly and Peter Hughes feel a sense of gratitude for the chance to work with those in the agricultural community.